I finally got around to SdrDx spatial filtering. The phasing control in SdrDx software works really well with my Afedri AFE822x. Up until now, most of my digital beamforming experiments have used PowerSDR or Linrad software for adjusting the phase and amplitude of two coherent channels. 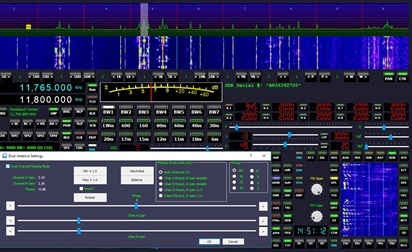 A few months ago, Chris Smolinski nudged me to try the latest version of SdrDx radio software which includes a phasing control. I finally spent some time on this and can report it works well. SdrDx is a lesser known application for software defined radio. SdrDx was written originally for the Mac, but has also been ported to Windows. Most important for me is support for the Afedri receivers, including dual channel. The program has an unusual layout, reminiscent of many early programs for radio control. It takes a bit of reading the manual to understand what all the buttons are and what they do. Two years ago, another software author Chris Smolinski of Black Cat Systems had been playing around with adjusting I/Q data to get beamforming. He did this by writing a piece of software that intercepts and modifies the data stream from a dual channel SDR. Following his experiments, he suggested building this into SdrDx, and that was done in the latest version. Now, SdrDx provides a separate phasing window (shown above, lower left) that provides individual gain for each channel, and well as a means of adjusting the phase between ±180°. You can listen to each channel separately, or add them together with a click of the mouse. I find that SdrDx does spatial filtering quite nicely with the AFE822x. For noise reduction, there is also a small waterfall display (lower right) which you can use to visually review the amount of noise removed from the passband of the received signal. My first efforts at SdrDx spatial filtering failed but only because I did not understand what I was doing. Follow these steps and it will work well for you the first time. Before running the software, set up the AFE822x for Dual Channel Diversity mode. SdrDx does not set this up automatically. If the Afedri is just in dual channel mode, you cannot do phasing. If you run SdrDx without selecting Dual Channel Phasing Mode in the Dual Antenna Settings window (lower left above) you will hear a signal running at twice the speed. This is because of the way the radio interleaves the data. Once you select Dual Channel Phasing Mode (checkbox) all works well. That covers my early mistakes and how to correct them. Currently, I am building a couple of wideband active loop antennas which I will space at least 100′ apart. Once they are up and running, this will make a great setup especially for Medium Wave DX. Hope to have this running by winter.